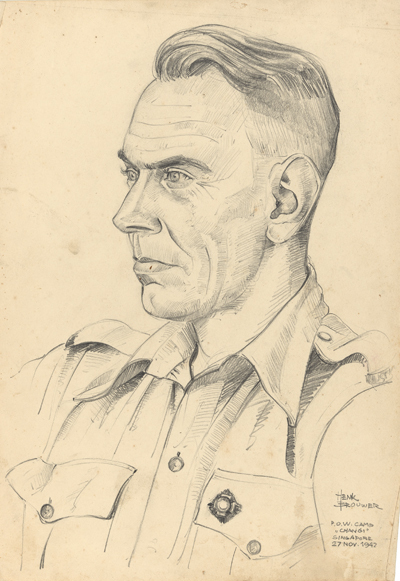 Hector Chalmers (1904-1978), AIF lieutenant (Australian War Memorial). Hector MacDonald Chalmers was born in Flixton (England) in 1904. His father Thomas was born in Edinburgh (Scotland), his mother in Manchester. Early in the 20th century the Chalmers family moved to Australia, where Hector joined the army. During the Second World War he was lieutenant in the 8th Division Provost Company when the Japanese occupier took him to Changi as prisoner of war. In Changi the Japanese left the enforcing authority to the allied pow’s. As a consequence the allied pows were sometimes punished by their own officers. One of these punishments was a stay in one of the ‘correction cells’, that were supervised by Hector Chalmers and his men. During his stay in Changi Chalmers wrote a chapter for The Changi Book, a manuscript that was written during the war by several pow’s in Changi and finally was published in 2015. After the war Chalmers became a politician with a special concern for the peace movement. As member of the Australian Labor Party he ran for the Senate elections in Queensland. He also attended the Third World Conference Against Atomic and Hydrogen Bombs in Tokyo in 1957. In 2011 a Japanese scientist published an article about Chalmers’ contribution to world peace. Hector Chalmers died in Queensland in 1978. His portrait, painted by Henk Brouwer, was donated to the Australian War Memorial in Canberra. There are two portraits of Hector Chalmers. The one displayed is unique: it’s the only portrait we know that is drawn by Henk Brouwer with a pencil.